rocky's bru: Jay cleared by Board: Bad news or good news? Jay cleared by Board: Bad news or good news? 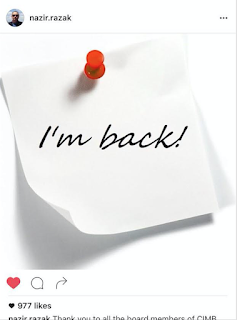 Updated 20/5: On his widely-followed Instagram account, Nazir thanked his Board members. End of story. His detractors, of course, will have a good laugh at the news that the CIMB board had found their own Chairman and former CEO Nazir Razak innocent of the charge that he had misused his position with regards to money in his personal account meant to be disbursed to certain politicians (do read the MalayMail Online story h e r e). "As opposed to the Islamic Bank CEO who "abused" his position via a FB posting?" 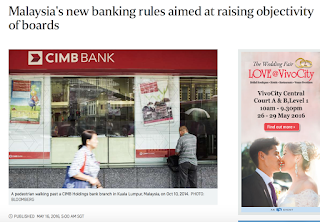 "That means the BOD of CIMB condones the bank staff in distributing political funds? If so - did the Bank review who the monies were paid to? Was there audit of all Nazirs transactions?" "Why not an independent enquiry but an internal, you can't investigate yourself ? Why not call MACC to do the investigations?" "Seems to appear like a conduit to clear name - very much like the DAP clearing LGE over his bungalow purchase before MACC starts investigation!" 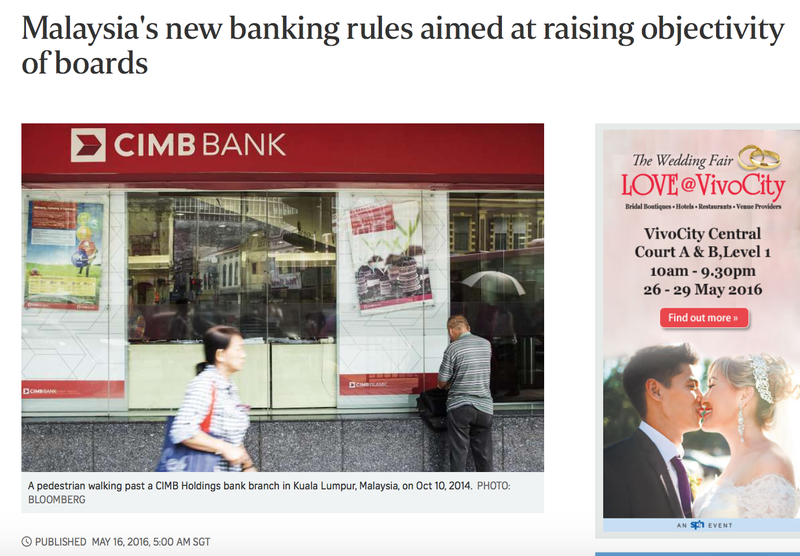 In any case, in a very related development, the Bank Negara is said to be looking at New banking rules to ensure that a former chief executive of a bank will never again be table to take over as Chairman of the bank's Board. Ops...lupa pulak. Kalau di Negara-Kapiaq, dia ngan abang dia sekali, dah lama bungkus. Obviously what Nazir had done by receiving money in his personal account the amouny RM28 MILLION is illegal. Bank Negara should have queried Nazir Razak for this huge amount under the Anti Money Laundering Act. Nazir is morally and technically incompetent if he doesnt realize this is money laundering. 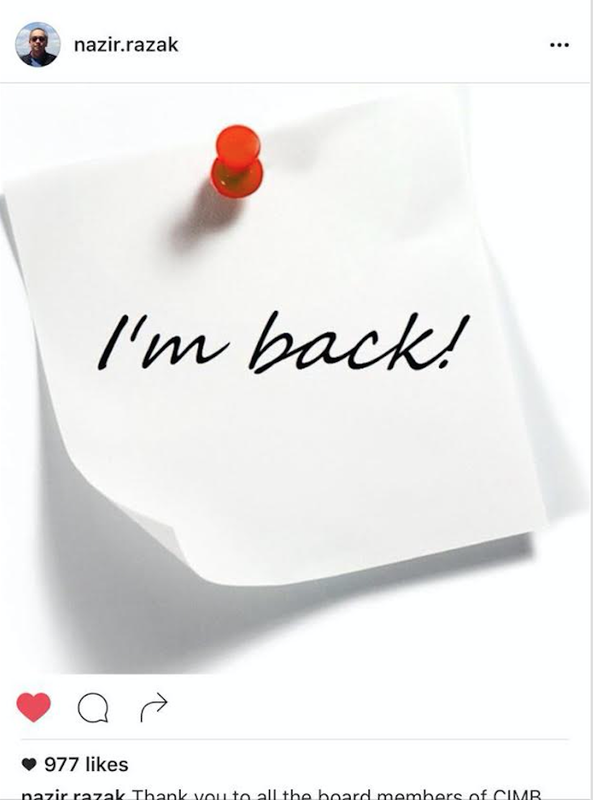 His brother use him as he can be trusted, family, to disburse the money for illegal purpose. This kind of people has no place in our banking system as he has proven to be untrustworthy. LHDN must do its duty to ask for details for taxation. Nazir Razak is guilty of money laundering by his own admission. His regret can be mitigating but he belongs behind bar like corrupt criminal he is. 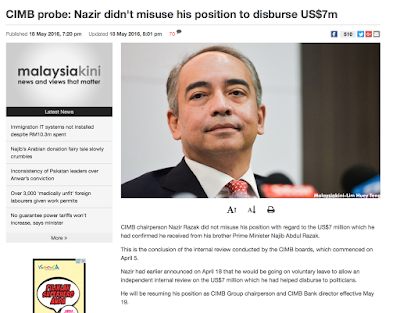 Yes, the CIMB board should have gone one step further to investigate the transactions and find out what exactly was Nazir doing with the money transfers. Did it break AMLA or BNM guidelines ? But then, they had to just investigate Nazir and clear him. The scope was set so the investigation team has to follow the scope and not investigate anything more than that. Sounds silly right ? Wrong ! The same went on with the 1mdb probe by the Task Force and PAC. Puiii !! The ANC said they expected Najib be exonerated by PAC and AG. And they were clamouring over every other remark of Nazir. Time to turn the table. Expected the Board to exonerate Jay too. One because BOD does not want to get in trouble with the ANC. Secondly because he is Najib's brother. Strange, now the critics are suing!